In August, 4 times more people gave up looking for work than there were jobs created. In other words, 96,000 jobs were created, but 360,000 people were so discouraged by their job prospects that they gave up looking for work and now the government doesn’t even count them as unemployed! 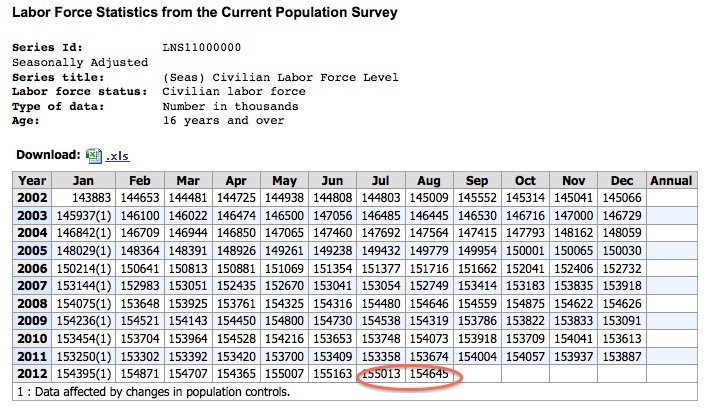 From the BLS, we see that the civilian labor force level dropped by 368,000 in August. Yet the BLS also says that only 96,000 jobs were created in August. rate edged down to 8.1 percent, the U.S. Bureau of Labor Statistics reported today. technical services, and in health care. So here’s the challenge. If you don’t believe me, certainly you will believe the hard, cold numbers from the Labor Department’s Bureau of Labor Statistics? Right?